The first important note is how sound travels. Any sound source projects outward in all directions. Direct sound travels from the source directly to the microphone. Other sound bounces off the other surfaces, often randomly. These other sounds then come back to the microphone. There is no issue with direct sound. It is the most authentic and the balance of the audio is pure. The problems start with the reflected sounds. Every reflection alters the sound a little, the more it bounces, the more the sound changes. In most rooms, the changes are not good. When you visit a church or cathedral, have you noticed how good the choir sounds? The quality of the sound is not by accident. The design of these buildings serves two purposes: to look good and to sound good. That level of sound requires a lot of space. Getting this same effect in a smaller space like a home studio requires the use of sound deadening foam to absorb any sound that would normally bounce off a surface. Ideally, cover every wall of the studio room with acoustic foam panels. These panels will ensure that the microphone picks up only the direct sound and almost no reflected sound. It might sound trivial, but when recording audio, there is a big difference between a normal room and a room with the correct acoustics. 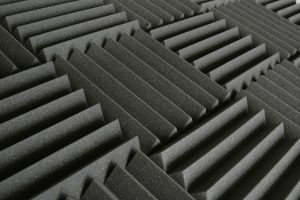 The Foam Factory specializes in foam products such as acoustic foam.